Lately skincare products with activated charcoal are gaining a lot of attention. Activated charcoal is specially processed pure carbon which is often used as a treatment for poisoning. Thanks to its detoxifying characteristics, activated charcoal is being used also in skin care products. Since I have a sensitive skin, I always select my skin care products very carefully. I rarely use skin scrubs, because they irritate my skin. A soap that cleans without irritating the skin sounded ideal for me. So I decided to give it a try. 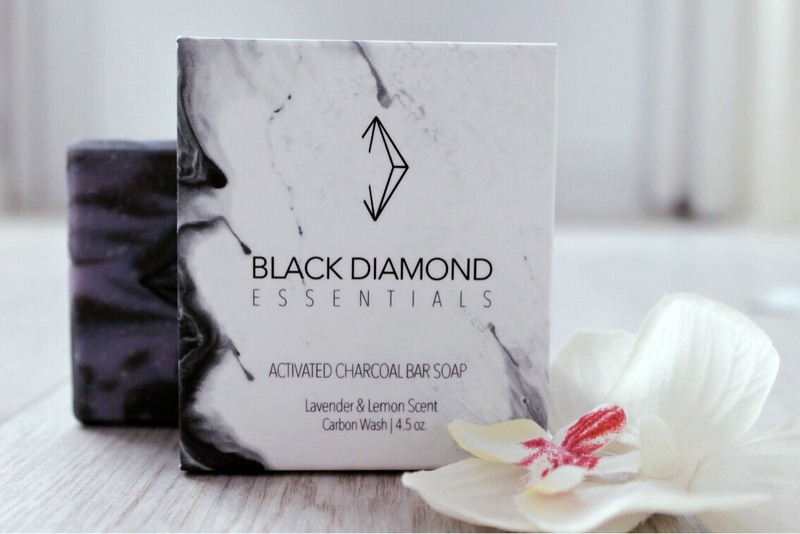 For the past few weeks I have been trying out a soap bar with activated charcoal from Black Diamonds Essentials. The brand stands for quality and clarity in ingredients offering the soap bar that not only contains activated charcoal, but also oils that moisturize the skin. The soap bar consist of the following ingredients: saponified oils of Coconut, Avocado, Olive, Palm, and Castor; Bentonite Clay, Activated Charcoal, natural colorants. It has very unusual for the soap deep purple-black color and intense lavender-lemon scent. In the beginning the idea of cleaning my face with charcoal seemed a little strange. As I have a sensitive skin, I even wanted to back off from this idea at first. Eventually, armed with a good foundation (just in case I needed to cover the irritation afterwards), I gave it a try. Since then it became an inseparable part of my morning routine. I have been using this soap bar on a daily basis for almost three weeks already. No irritation,no dryness. My skin feels so clean and smooth afterwards. Plus its scent of lavender and lemon is very refreshing in the morning. Thanks to its dark purple-black color it became also a stylish accessory in my bathroom. I fell in love with it and would definitely recommend to try it out. I am sure you will love it too. This is it for this time. I hope you enjoyed the post. If you have experience with products containing activated charcoal I would love to hear your opinion! Please share your thoughts in a comment bar below! Stay in touch for more! Till next time!! Great review! Thanks for sharing! I have never heard about charcoal soap before! Will surely check it out. hi Caroline, I am very happy you found this review useful. I would definitely recommend you to try this soap out. I am sure you will also fall in love with it like I did. Wow, i love the color of the soap! Me too 🙂 It looks very cool in my bathroom.